Foodbuzz contacted me. I received coupons for free samples of Mrs. Paul's and Van de Kamp's ParchmentBake. This post is part of the Foodbuzz Tastemaker program with Mrs. Paul's and Van de Kamp's. We are big seafood fans. So I was sure my family would love this. I choose Garlic Butter and Lemon Pepper. The fish fillets in a parchment paper bag. It bakes the pre-grilled, tilapia fillets in a sauce.There was just the right amount of sauce on the fish. It was good! 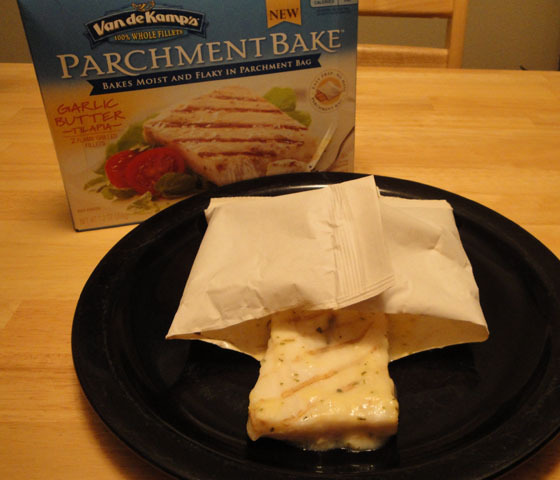 Each, ParchmentBake fillet has less than 80 calories and can be found in your grocer's freezer. I received free sample (coupons) from Foodbuzz Tastemaker program with Mrs. Paul's and Van de Kamp's for the purpose of this review. Opinions stated above are entirely my own. I have not been compensated to publish positive post. I LOVE how this product bakes right inside a parchment bag so it doesn't stink up the house and requires no clean up!!! What a fascinating review! Thank you for introducing us to this marvelous product! My views on food and food preparation techniques have been altered forever!! I haven't seen those in stores here, but I can't say I looked for them either. I like that they are so low in calories.